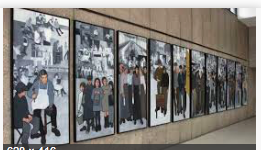 Best known as the Labor Mural, artwork created by Judy Taylor, now hangs in the entrance to the Maine State Museum in Augusta. Dan Holman, a team leader for the Acadia Team at Maranacook Middle School applied for the Maine Arts Commission Ticket to Ride funds for a trip to the State Museum. After reviewing the application I was curious about the trip and the details of the lesson/unit. Dan worked with Joanna Torow the Chief Educator at the Maine State Museum to design a field trip that would coincide with the studies back at school. They took a deep dive look at the meaning behind each of the murals panels. The museum has been working with outside contractors to create a digital kiosk that will allow visitors to have a more in-depth interpretive experience in regards to the mural using additional museum objects, photographs, documents, and oral history. They are interviewing the artist, Judy Taylor, and will include a video of her talking about her process and goals for creating the work. Through this work, the curator and the museum’s educators have made more connections to the artwork and the exhibits on display, it is these insights they hope to share with the students visiting. To prepare of the trip, the students read short essays (200 words or less) they have written about each panel. They were excited to hear their personal thoughts on the panel, as an artwork with a very specific goal and as a historic document. 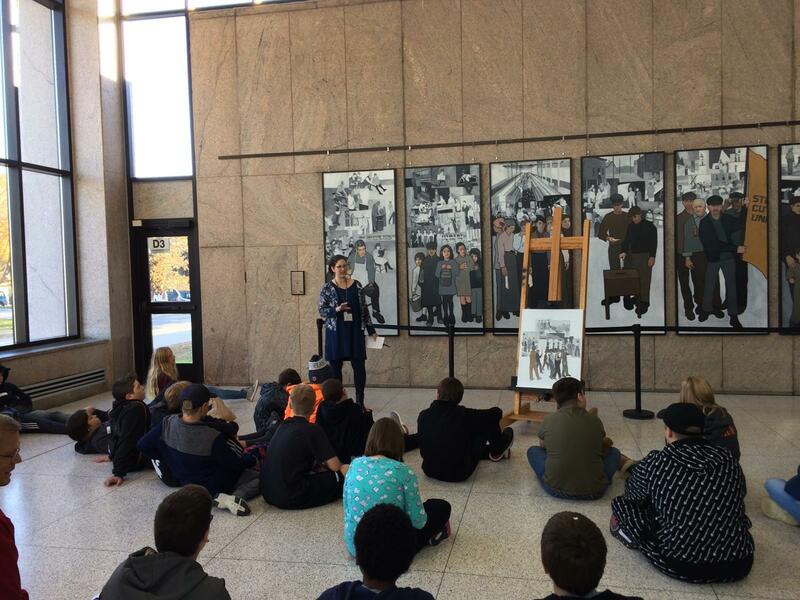 Museum Curator of Historical Collections, Angela Goebel-Bain and Joanna lead a discussion with the students (based on discussion and emails with Dan Holman) in front of the Maine Labor Murals. They talked about the subjects as well as the choices the artist made in what she included in each panel, what she left out, how she choose to depict the subject, tools, and people, and how she deliberately used the foreground and background to extend the storytelling. Dan plans to have the students work on an journal activity in response to the mural after the discussion at the mural. The students will also be took part in two 30 minute gallery programs focused on either Ice Harvesting, Granite Quarrying, Logging & Lumbering, and a guided tour of the Made in Maine exhibit (19th century work and life in Maine with a focus on textile productions and waterpower). The mural provides first hand knowledge from an artists’ perspective of so much history – granite quarrying, textile industry, child labor, and wood industry all included images in the mural. 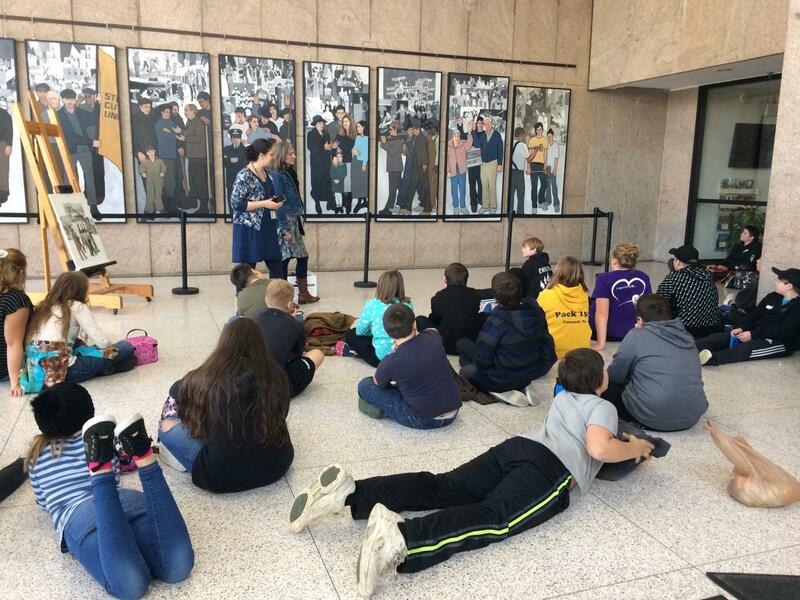 It provides the opportunity for the educators – museum and school – to reinforce student learning. If you’d like to learn more about the museum programs please contact Joanna Torow. If you’d like to learn more about the unit that is underway please contact Dan Holman. Thank you to both for providing information for this blog post and the opportunity to be at the museum during the presentation. The Maine Arts Commission Ticket to Ride program provides funding to defray the cost of travel for Maine schools wishing to visit Maine arts based venues and events as part of a well-rounded curriculum. The goals of the trip should support student learning and be aligned with the Maine Learning Results Visual and/or Performing Arts standards. Any PK-12 school in Maine with a documented free and reduced lunch student population between 30 and 49 percent is eligible to receive support of up to $300 each school year. Any PK-12 school in Maine with a documented free and reduced lunch student population of 50 percent or greater is eligible to receive support of up to $500 each school year. Applications are accepted throughout the year and funding will be made available approximately one month after they are submitted. Schools may apply more than once a year as long as they are applying to attend a different event, bringing a different student population or have not expended their eligible amount.